When installing a bund it is essential that it is fit for purpose. There are many aspects to consider in designing a bund to ensure it is fully functioning and complies with regulations such as the Oil Storage Regulations and CIRIA 736. The bund must be large enough to hold 110% of the capacity of the largest tank or 25% of the total storage, whichever is larger. These will partly be dictated by the capacity requirements but will also need to take into account spigot flow/jetting failure and the tidal wave effect caused by catastrophic failure. 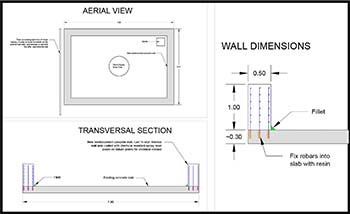 This will also be largely influenced by capacity requirements however building a bund with particularly small walls make it more susceptible to the tidal wave effect, building a bund with tall walls can cause access issues, limit ventilation and make firefighting difficult. It is preferable to construct a bund from concrete with an internal rebar structure, however in many circumstances well-constructed and lined brick built bunds will be sufficient and cost effective. 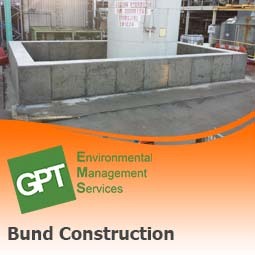 It is usually recommended that bunds are lined with protective coatings to prevent the contained liquid from attacking the bund walls, this is especially important when the bund holds corrosive materials. For many sites, especially remote/unmanned sites, automatic bund dewatering devices can be installed to remove water from the bund but leave the contaminant contained. Penetrations into bund walls for pipework or cables should always be avoided. Where they do occur it is essential they are effectively sealed using a methodology approved by site/industry requirements. As you can see designing an effective and regulatory compliant bund is not a simple task. The requirements of the bund are bespoke to every situation and must be tailored to site specific conditions. As well as the points mentioned above you may also wish to consider additional controls e.g. where the bund is in a high traffic area you may look to install impact barriers. We are experienced in designing bunds for all different sized tanks, a variety of liquids and for all different types of site e.g. COMAH, electricity substations, hospitals and factories. If you have an existing bund which you are concerned does not meet requisite standards or if a defect has been discovered by an external body e.g. environmental regulator or ISO 14001 auditor as well as designing new bunding we can also look to provide specifications for upgrading existing bunding to ensure it is fit for purpose and fully compliant to legislation. If your tank is being installed in a constructed bund, the bund should be built using reinforced materials, with no damp-proof course and lined to ensure it is impermeable to oil. A bund that is open to the elements should also have a sump formed in the base so you can remove rainwater for safe and legal disposal. “The quality of design and construction is fundamental to the integrity of the containment system. It is therefore imperative that any designer, contractor or maintenance works operative engaged to construct, extend or modify a containment system is experienced in designing and constructing to the relevant class of containment. As a minimum, the parties should have a proven history of carrying out the relevant type of work.